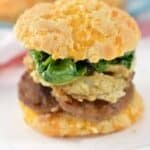 You’ll love this easy Keto Breakfast Sandwich if you are looking for a low carb breakfast recipe. 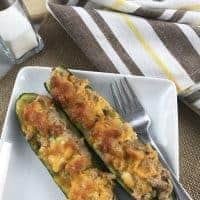 I have finally found my favorite easy low carb breakfast. 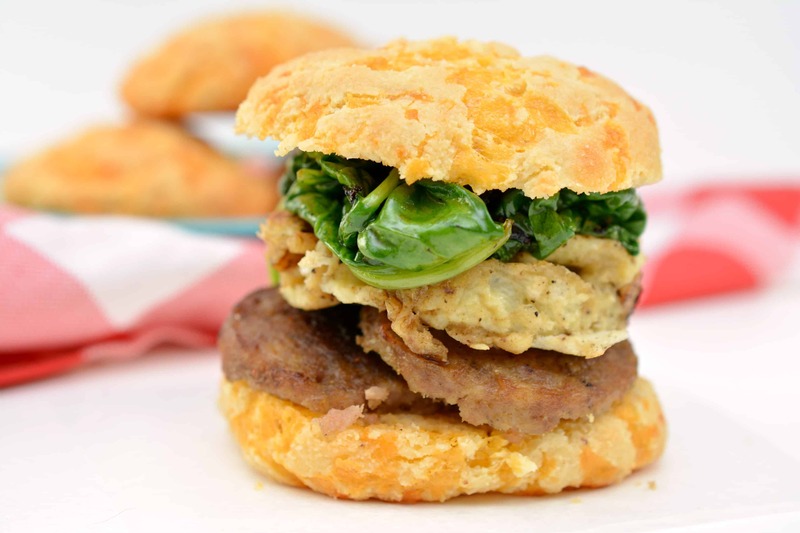 Between the delicious Keto Cheddar Biscuit and the yummy sausage and spinach– this recipe is a Keto winner! I often get tired of an egg breakfast but I have found that this is the best low carb breakfast even if it has eggs! 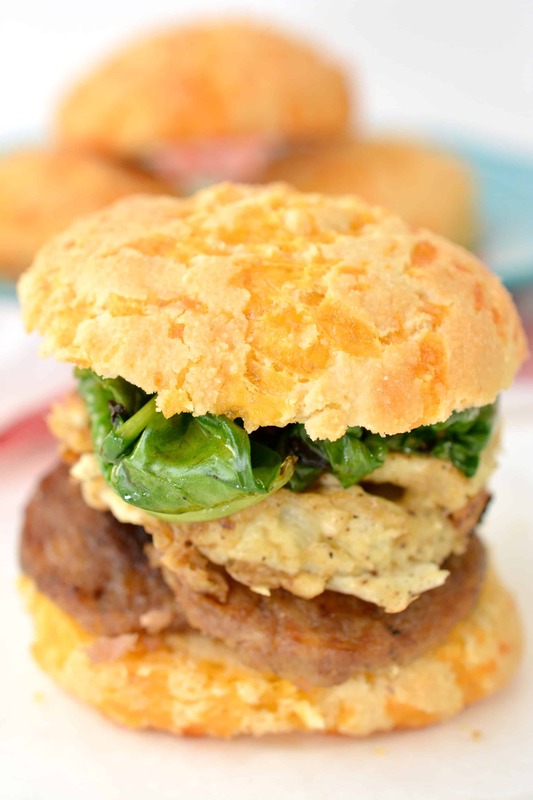 The other flavors are so delicious that the breakfast sandwich is a family favorite. I could eat it every morning. 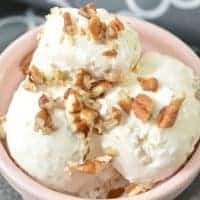 I hope you enjoy this easy keto recipe. 2. In a mixing bowl, combine 4 ounces of almond flour and 1 teaspoon of baking powder. Mix or sift to combine well. 3. In a separate bowl, combine 1 large beaten egg with 1 tablespoon of heavy whipping cream. 4. Pour the egg mixture into the almond flour dry mixture, and stir until just combined. 5. 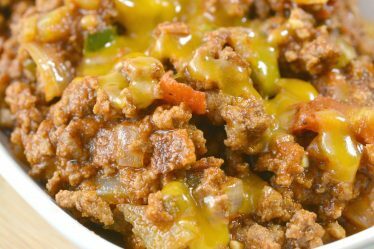 Add ¾ of a cup of shredded cheddar cheese to the mixing bowl, and fold it in well. 6. Divide the biscuit batter into 4 equal portions, and form them into a rounded biscuit shape. 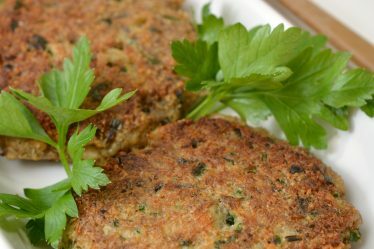 Place them on a baking sheet lined with parchment paper, and bake for 15 minutes. 7. 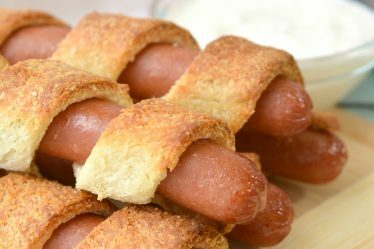 While the biscuits are baking, place the sausages in a skillet over medium-low heat, and cook them covered for 12-14 minutes until they are cooked through. Flip them once halfway through their cook time so that the other side of the sausage can brown. Once the sausage has finished cooking, set it aside, and keep warm. 8. Remove the biscuits from the oven, and place them on a cooling rack. 9. 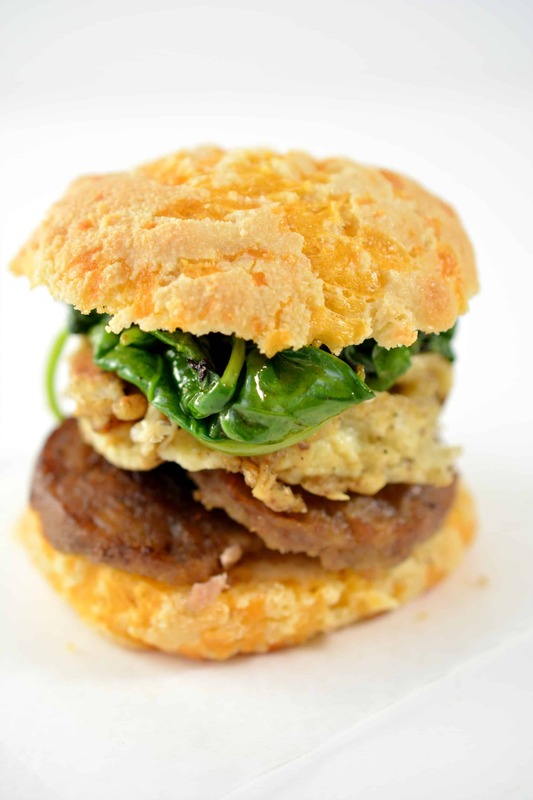 While the biscuits cool a bit, add 4 beaten eggs to the same skillet you cooked the sausage in. Salt and pepper to taste, and cook until they reach your desired consistency. Try to leave them as one solid circle of eggs, this way, you can use a circle or square shaped cookie cutter to cut out four nice portions for your sandwiches. Remove the egg from the skillet and set aside to keep warm. 10. Add 1 cup of spinach to the same skillet that you used to cook the sausage and the eggs. Mix in 1 tablespoon of butter, and cook the spinach until it is just beginning to wilt. 11. Cut your biscuits in half. 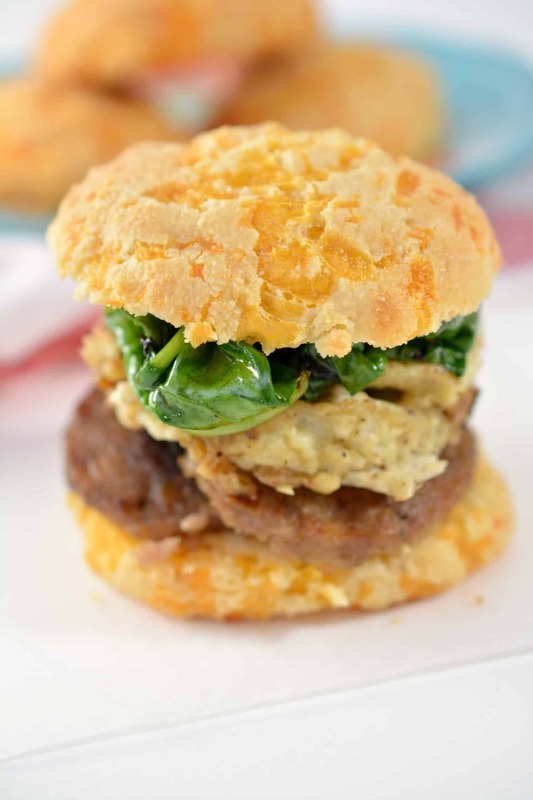 Layer the sausage, egg and spinach onto the bottom half of the biscuits, and then add the top of the biscuit to form your breakfast sandwich.